John Watts of Stamford was the first clockmaker to work in that town, and one of the very first to work in the county of Lincolnshire. The first was Guy Dickinson, who was born in 1630 in Grantham, but worked in Lincoln from 1657 till his death in 1686. We know from his inventory that Guy Dickinson made watches as well as clocks but, despite a career of almost thirty years, no example of his work is documented as existing today. John Watts began his career at Stamford in 1682, when he was granted freedom to trade. He trained, and was succeeded there by, his older son, John junior, of whom we know little, and his younger son Robert, who became a well-known clockmaker there. Like a good many others, these clockmakers are famous today in their own locality. Their work is prized more highly than that of many country clockmakers, not particularly because it was special, though they could make special clocks when called upon, but because examples are not often met with today. I suppose one reason for that is that local owners seldom part willingly with what they regard as a piece of local history. Several John Watts turret clocks have been recorded by various researchers and it is principally through these that we know the work of John Watts in these earliest years, and even that we know of his existence at all at that period. Many, though not all, of his church clocks were signed IW followed by the date of making. It may well have been that the market for domestic clocks for a rural clockmaker at this time was very limited as those country gentlemen who could afford such things probably bought them from London, and it appears to be through his work on church clocks that he first became established. The origins of John Watts have remained unresolved, despite the fact that several people have carried out research into the lives and work of both John and his son, Robert Watts, the latter by now fairly well documented. In 1975 Laurence Tebbutt, the former Librarian and Museum Curator at Stamford, published a book 'Stamford Clocks and Watches' in a limited edition of five hundred, but unfortunately much of the stock was destroyed in a fire. In 2000 Michael Lee published a small book about them , 'John Watts Stamford Clockmaker 1661-1704'. In 2001 a book 'Lincolnshire Clock, Watch and Barometer Makers' by A. S. H. Wilbourn and R. Ellis also included information on some members of the Watts family as well as a photocopy of John Watts's inventory of 1720. In 2002 Robert Ovens and Sheila Sleath produced a book 'Time in Rutland', which includes information of John and Robert Watts, father and son, some of it based on Lee. These researchers have found mentions of John Watts in such records as churchwardens' accounts. Stuart Walker has been gathering information for years in preparation for what promises to be a massive book on Lincolnshire clockmakers. Despite the work of all these researchers, the origins and early life of John Watts remain conjectural and I and I therefore decided to undertake some research myself into the lives and work of these men. I have discovered a little more about the lives of the makers and have uncovered a few more of their clocks, but, despite all this, the origins of John Watts senior of Stamford are hazy. One suggestion was that John Watts, the Stamford clockmaker, was the John Watts, who was born in Northamptonshire in 1630 at East Haddon and baptised at Long Buckby, as the son of John and Mary Watts. The problem with this is that it would make him about 53 when his first child was born and 62 (or maybe even 73) when his last child was born, depending on just how many children we can attribute to him for certain - some of the later baptisms of children to a John Watts in Stamford may have been to a different person of that name. Fathering children at this sort of age may have been physically possible, but it was just as unusual then as it is today to start thinking of producing a family at that age. It would also make him about eighty-nine years old when he moved his business away from Stamford to set up a new shop in Boston about 1719, a little late in life for a career move. Again this is not impossible but unusual, and I am not convinced this is the right John Watts. We don't set off on a genealogical trail expecting the unusual. What we do know is that a John Watts was working on clocks by 1661, as he serviced local church clocks. It is unlikely that the church authorities would let a twenty-year-old loose on their precious clock, so we might guess he was at least thirty by 1661, setting his year of birth about 1630 or earlier. He appears to have been living at Caldecott, at the extreme southern tip of the county of Rutland, between 1661 and 1670, when he worked on the church clock of nearby Lyddington. 1. This eight-day longcase by Robert Watts of Stamford is in its original oak case, untouched since it was made. It dates from the 1740s. Click for closer view. The John Watts, who later worked in Stamford, Lincolnshire, has hitherto been thought to have been this John Watts of Caldecott, who was styled a 'watchmaker' when supposedly documented along with his brother, Daryl, a barber at Northampton, as administrators of the estate of their father, John, who died in Northampton in 1673 without leaving a will. But I now find this was a combination of errors. I have a copy of this administration on my desk, and the person who died in Northampton in 1673 was a Thomas Watts, not John, which puts a whole new light on the problem. Daryl is a modern name which I doubt existed in the seventeenth century and I found on examining the document that 'Daryl' was actually a misreading of Samuel! The administration was granted on the 21st June 1673 to Thomas's widow, Elizabeth, and the two sons, John a watchmaker and Samuel a barber, all styled as 'of Northampton'. It was not surprising I had failed to find any trace of a John Watts with sons named John and Daryl, when I should have been looking for a Thomas Watts with sons named John and Samuel! Their presence at the parental home in Northampton at the time of the father's death does not necessarily mean that they lived in that town. With the possible exception of a period around 1673, when he may have been living, perhaps temporarily, at Northampton, we have an uncharted gap in the life of what was thought to be John Watts of Stamford between the known period 1661-70, when he lived at Caldecott, and the date of his freedom at Stamford in 1682. Recently (in 2008) there came onto the market a much altered lantern clock of about 1680 with a genuine signature 'John Watts of Apethorpe fecit'. The genuine dial sheet of this clock is from the oldest known surviving domestic clock of Lincolnshire make, as the only earlier maker, Guy Dickinson, has left no work behind that we know of. Apethorpe is not far from Caldecott and just south of Stamford and north of Oundle, in Northamptonshire. The Apethorpe church clock, signed 'IW 1704', is attributed to John Watts of Stamford, which is the more explicable if the Watts family was known there from the 1670s. This lantern clock might pin him down to living in Apethorpe in the period between 1673 and 1682, in which latter year one John Watts of Stamford was made free as a whitesmith on payment of an entry fee of £3. 6s.8d. There is a reason why these ancient fees often involved such odd fractions of money. Six shillings and eight pence (one third of a pound) had been the value of an obsolete coin called a 'noble', which originated in the fourteenth century, and, though long out of use by the seventeenth century, must have remained as a basis in setting ancient values. £3. 6s 8d was, in the distant past, ten nobles. My re-directed search uncovered a baptism of a son, John, to parents Thomas and Elizabeth Watts at the village of Welton, only about five miles west of Northampton in 1617, and another baptism of a son, Samuel, to parents of the same name in the neighbouring village of Long Buckby in 1622. I cannot be certain this is the right baptism, but how many baptisms of John Wattses can there be at this period in this locality with what is probably a unique combination of named relationships. But this John Watts, a 'watchmaker' at the death of his father Thomas in 1673, would have been 103 years old when he set up a new business shortly before his death in Boston in 1720 and so that made no sense. The answer must be that the John Watts who set up in Stamford in 1682 was NOT the same person as the John Watts of Caldecott and Apethorpe (the watchmaker son of Thomas of Northampton). In other words there were TWO clockmakers named John Watts, probably father and son - three if we include the namesake son of the Stamford man, who was born about 1682 or 1683. The existence of John Watts junior of Stamford, the eldest of eight children of John Watts senior there, is known only because he was apprenticed under his father from 1697 to 1704, when he was freed at Stamford. No work seems to be attributable to him, so we can take him out of the equation . I came across several possible baptisms around 1660 in that same locality for a John Watts, who could have become John Watts of Stamford (as the son of a John Watts, who might have been John the watchmaker, the son of Thomas), but the nature of the records means that none of these can be identified for certain as the right person. In February 1682/3 John Watts of Stamford had a child named Jonathan baptised there at St. John's church and seven other children were baptised there over the years (between 1684 and 1693), in each case to a wife named Elizabeth. John's marriage to Elizabeth has not yet been traced with any certainty. Nor has the baptism of his eldest surviving son, who was named John and is believed to have been born about 1682. It may be that one day we shall turn up this marriage, and perhaps in the same church might be the baptism of the first child, John. Marriages often took place in the bride's home parish, and a bride often went home to be with her mother for the birth of her first child with the result that the baptism can be in the parish of her parents, not necessarily in the parish where she lived with her husband. Several church clocks are known to have been made by him including probably Castle Bytham 1683, and certainly Empingham 1686, Peterborough Cathedral 1686/7, Clipsham 1688, Nassington 1695, Apethorpe 1704, All Saints Stamford 1705. In 1687 he installed a new church clock in Northampton, where the family was already known. In 1687 he took Boniface Bywater as apprentice till 1696. All these events after his freedom of Stamford in 1682 can be assumed to relate to John Watts of Stamford. Those dating from 1661 to about 1680 cannot refer to him and may well refer to the earlier John Watts of Caldecott and Apethorpe, whose father, Thomas, died in 1673 in Northampton. 2. The neat hood has the early style of pillars attached to, and opening with, the door. Glass side windows are an early feature. Click for closer view. John Watts worked at Stamford till shortly before his death, then moving to Boston, Lincolnshire, where he is believed to have worked briefly till he died early in the year we would now call 1720. His inventory of 10th March 1719/20 mentions 'In the shop two clocks and three cases - £6. 10s.0d.' A note at the side says "query whose they are", which I assume means the appraisers needed to clarify whether they were his clocks ready for sale or clocks he had in for repair. Either way it indicates he was still making and selling clocks as well as repairing them. The shop tools were valued at 18 shillings, his book debts £1. He also had three old muskets, which confirms what we already knew in that he was also a dealer in, or repairer of, firearms. His total worldly wealth amounted to £12, 13s 6d. Not much to leave behind for a life's work. Of course he may already have given away such wealth as he had to his children, and he may have been taking things more easily in semi-retirement. But what intrigues me is why he upped and moved to Boston, some forty or more miles from his home town of Stamford, where he had lived for more than forty years, and this at the age of about sixty, if we work on my assumed year of birth and ninety if we work on the year he was previously believed to have been born. I was curious as to why he chose Boston. It can hardly be co-incidence that we find two or three families named Watts living at Boston, including Stuart Watts, a clockmaker! I have been unable to find who Stuart Watts was or where he came from, but he married there on 9th May 1723 to Mary Rigall, by whom he had several children between 1724 and 1735 and was later recorded working at nearby Holbeach in 1755. It seems to me to be no co-incidence that a clockmaker named Watts should suddenly appear in Boston immediately after the death there of clockmaker John Watts. What seems clear is that Stuart succeeded to the clock trade in Boston after John Watts's death. I imagine Stuart must surely be a relative of John, but I have no evidence of that. Robert Watts was born in 1688, son of John Watts (and his wife Elizabeth), to whom he was apprenticed in 1704, and freed in 1711. He was married to an unknown lady named Hannah and worked in the district of St. Johns Stamford from at least 1719 till his death in 1759. Several children were baptised to him there. These included John, born in 1719, who became a baker, and must have been earning his own living by 1739 but was not made free at Stamford till 1749, presumably after his father's death. Other children of Robert were Robert born 1722, Charles born 1724, Elizabeth born 1727 and James born 1739. Charles followed his father's trade as a clockmaker, and more about him appears below. Robert's marriage to Hannah has so far remained undiscovered. However a Robert Watts was married on 25th June 1712 at Wigston in Leicestershire, about thirty miles west of Stamford, to Susannah Bushby, and Susannah can be abbreviated to Hannah. She seems to have been born the daughter of Thomas and Mary Bushby of Oakham in 1688, the same year as Robert Watts, which means they were both twenty four years old. Oakham is about half way between Stamford and Wigston. Robert had trained under his father and was made free to trade in his own right at Stamford in 1711. I imagine he felt that was long enough to serve under his father's control. My bet is the couple eloped in 1712 to marry at Wigston. Then at Apethorpe, a parish a few miles south of Stamford, where John Watts the elder, Robert's grandfather, had once lived, a Robert Watts had a child named Susanna baptised in January of 1715. Robert Watts may not have actually worked in his own right in Stamford till about 1719, when we know his son, John, was baptised, and by which time we know his father, John Watts senior, had moved miles away to Boston. We last hear of John Watts in Stamford in 1707, when he serviced the Burghley House clock, but he may have been still in Stamford through the events of 1712 and 1715, during which time Robert stayed away. Lee notes that in 1709 his former apprentice, Boniface Bywater, made a clock for St. Mary's in Stamford and in 1710 repaired the clock in Browne's Hospital, Stamford. This may imply that John Watts was not up to the job by virtue of age or health and that his son, Robert Watts, was not available, since Lee records that Robert did service the clock regularly for forty years from 1719, the year of John Watts's death. It may be that John Watts had already moved to Boston by 1710. I imagine John Watts left Stamford for Boston between 1707 and 1715. Perhaps they could not get on together, or perhaps John eventually thought it was time he left the Stamford business in Robert's care and moved away to take things a little easier. This is somewhat conjectural but the pieces fit. Robert Watts was buried on the 11th November 1759, yet an account was sent for work on the Burghley House clock dated 17th December 1759! Charles Watts was born in 1724 at Stamford, the son of Robert & Hannah Watts, clockmaker, and grandson of John Watts of Stamford, who had died only four years earlier at Boston, and can never have had the pleasure of knowing this grandson. Charles became a clockmaker, no doubt training under his father, Robert, at Stamford. Charles was married on the 14th July 1752 at Hacconby, just north of Bourne, to Mary Vokes, and the couple moved to live in Bourne by 1753, when their first child, John, was born. Presumably Charles named John after the grandfather he never knew, but with whose work he must have been familiar. Tragically the child died within the year , as did their second child, Ann, born 1755, dying in 1756. Their later children Charles, born 1758 and Mary, born 1759, did survive. For him to leave home to marry and set up in business in a strange town suggests to me there was a another break in the family, a separation from his father, perhaps on account of this very marriage. His father, Robert Watts, died in 1759, only seven years after Charles had set up in Bourne. Yet Charles Watts continued to practice his trade in Bourne for the best part of half a century. A notice in the local newspapers on 20th April 1798 records: "A few days ago Mr. Charles Watts, watchmaker of Bourne in this county, died aged 76 years". Longcase clocks are known by him signed at Bourne. 3. The twelve-inch dial is beautifully engraved. Original blued steel hands. Click for closer view. 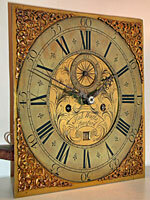 Longcase clocks by John Watts of Stamford seem to be uncommon and very few seem to have been documented. There is the spectacular marquetry-cased musical example, which was offered for auction on 4th July 1990 and was reputedly sold later to a foreign buyer for £48,000.00, but was refused an export licence on account of its historical importance. This has a three-train posted movement of the lantern type and offers a choice of two tunes playing on twelve bells with fifteen hammers. Then there is the clock in the Mayor's Parlour in Stamford, an eight-day in a lacquered case, which stands almost eight feet high. Apart from those two sophisticated clocks I know of only three other examples, each of them eight-day clocks, these being more modest ones in oak. It seems that he progressed into longcase clocks increasingly over time. Michael Lee records a very rare marquetry bracket clock by him, with a turntable base, a very unusual item for a provincial maker of this period. Five lantern clocks are known signed by John Watts. One is the Apethorpe clock mentioned above, and is signed 'John Watts of Apethorpe fecit', which was probably by John Watts from Caldecott, who had moved to Apethorpe. It is clearly in a much earlier style than the other four known lantern clocks by John Watts, which are signed at Stamford. What appears to be the earliest of the four Stamford lantern clocks is signed 'John Watts of Stamford' and belongs to an English collector and is pictured in Lee and in Ovens & Sleath. One signed 'John Watts Stamford', was sold at auction in America in 2006 and is pictured here. These three lantern clocks are full-sized examples standing about 15 1 inches. A miniature example standing only 9 1/2 inches with verge pendulum and alarmwork, signed 'John Watts Stamford Fecit', was sold at auction in 1986. Another miniature, signed 'John Watts Stamford Fecit', and now converted to a single fusee spring movement was sold at auction in 2002. His lantern clocks follow the constructional principle of London, though his engraved style is more provincial, especially in the dial centres, which are a series of whirling scrolls emanating from VI. A lantern clock formerly with verge pendulum, now with anchor escapement, signed 'Robt. Watts Stamford' was sold at auction in 1988. Another, with original verge escapement, signed above the dial centre 'Robt. Watts Stamford', having been sold at auction in September 1994, was pictured in Clocks Magazine in December 1994. Another conventional lantern clock is known signed 'Robt. Watts Stamford', which was first illustrated in Clocks Magazine in April 2002. That makes a total of three known lantern clocks by him, plus the one I call a hybrid clock. In 2002 I discovered the hybrid clock by Robert Watts, which is pictured here. This is exceptionally unusual for any maker and is a unique example for him. The clock was first illustrated and described by me in Clocks Magazine for April 2002. It is a sort of half-way house between a true lantern clock and a hook-and-spike clock, a type I termed a 'hybrid' clock. This kind of clock was entirely unknown until I discovered one of this type in 1987 made by Walter Archer of Stow on the Wold, which I illustrated and described in Clocks Magazine in January 1989. Four are now known by Walter Archer. Just this year a similar hybrid clock was brought to my attention made by John Michell of Chardstock. I am not suggesting that there was any connection between these makers. It was probably Robert Watts's idea of making a cheaper clock that looked like a lantern clock, as I think it was with Archer and Michell, all three men hitting upon the idea independently. This clock has no hanging hoop or spikes. It probably made to sit on a shelf. A handful of longcase clocks by Robert Watts has been recorded, four or five being simple thirty-hour examples, mostly single-handers with square-posted movements of the post-framed type - in fact very ordinary clocks. Not surprisingly his eight-day clocks are of better quality. I know of three eight-day clocks including the one illustrated here. Remarkably few domestic clocks have been documented by John Watts (two of two of that name?) and by Robert Watts, who between them were in business for almost a hundred years. We know a busy rural clockmaker could produce twenty five clocks a year. I doubt if we know one hundredth of the 2,500 clocks they could have made in that period, which is an amazingly tiny proportion, even allowing for their strong concentration on turret clocks. I suspect many more exist, cherished by proud owners as pieces of local history. And of course unless they come onto the open market, we rarely hear of such clocks. An extended version of this article was published in Clocks Magazine.